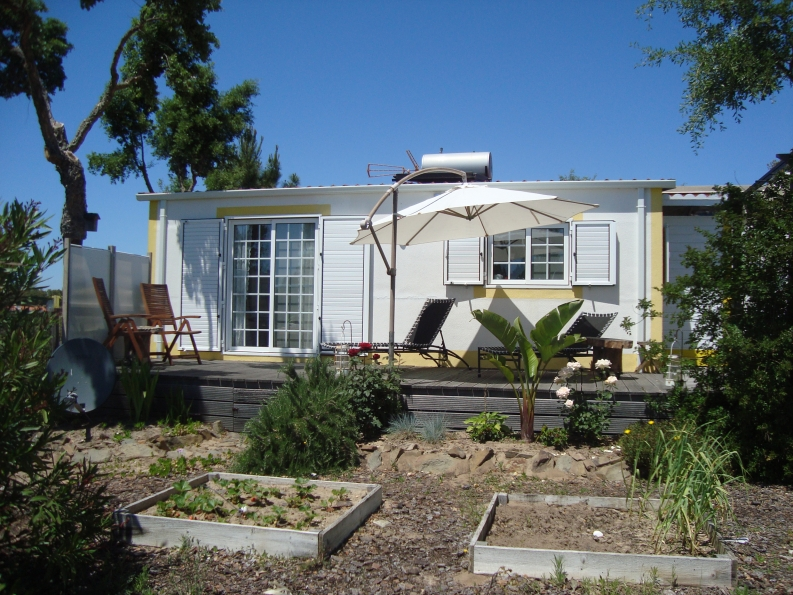 Located within the Monte Naturista O Barao naturist campsite in the Alentejo province of Portugal. Situated between Lisbon and the Algarve and only 35 km from the sea, Monte Naturista o Barao is one of Portugal’s leading naturist campsites. The chalet is situated on a beautiful and easily accessible large plot on the campsite, which covers 7 hectares, and is surrounded with terraces and an established garden which is open to the surrounding nature. Steel construction with insulated aluminium composite panels, aluminium frames and (rolling) shutters, sliding windows and doors with double glazing and shutters. Aluminium roofing tiles with gutters and drainage. The bedroom and bathroom have electric shutters. 3 air conditioning units and heating in all rooms. The living room is fully furnished, including TV, radio and CD player. The kitchen is fully equipped with a table and 6 chairs, microwave oven, 4 gas rings and extractor, dishwasher, fridge/freezer, black marble countertops, hot/cold water supply, pans, glasses, plates and cutlery for at least 6 people. The second bedroom has two single beds, a large wardrobe and small sink. The main double bedroom has wall units and a large wardrobe. The bathroom is fully tiled with WC, shower, bath and washbasin. There is an outdoor shower with a hot and cold water supply. Hot water is provided via solar panels. Free WiFi reception via an antenna and amplifier. Satellite receiver and antenna for Portuguese television. A large wooden shed, of approx 6m2 housing a washing machine and dryer. Surrounding terraces of hardwood +/- 90 m2. Garage of bamboo, 5 x 3 metres (shade). Land area at least 300 m2. Beautiful established garden with automatic watering system. Large wooden table with six more chairs outside. Plastic garden table with 4 chairs outside. Two sunbeds with cushions provided. Two pavilion awnings of 9 m2, detachable. Double bench with table between.